ROOKE Laneway in Devonport was brought to life last night as part of National Youth Week. The Reclaim the Lane festival is in its third year. 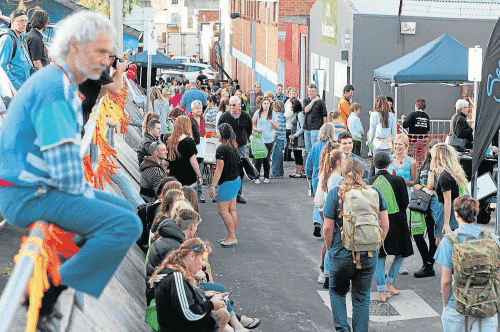 Devonport City Council community sustainability coordinator Damien Collins said each year the event has grown due to support from young people and the broader community. ‘‘Its primary objective was to be a part of celebrating National Youth Week. Within that were two goals, to offer young people a celebration of youth culture and the second objective was to offer a chance for the rest of the community to celebrate young people,’’ Mr Collins said. With free pizza slices as a draw card, young people enjoyed live music, an aerosol art demonstration, free hair cuts and received information from a variety of local service providers. ‘‘We hope they had fun, maybe they tried something new that they haven’t tried before,’’ Mr Collins said. ‘‘We’ve had a lot of young people involved in the implementation [of the festival] so for those young people we hope that they have learned new skills and lastly, we hope to have showed off the positive attributes the young people have brought to our community.’’ The event was run by the council in combination with the Devonport Regional Gallery and Youth family and community connections. A Tasmanian woman is using social media to reach out to teenage girls around the world who are experiencing hard times. Our wonderful CEO Cate Sinclair is featured, on ABC News. LAUNCESTON man Garrison Lewandowski credits mental health program Headspace with saving his life and says the expansion of services in Tasmania will mean more people can get the help they so desperately need. Federal Health Minister Tanya Plibersek was in Devonport yesterday to launch a new Headspace outpost as part of a $197 million Rudd Government initiative. Headspace caters for 12 to 25-year-olds and is operating at 55 sites around Australia. Ms Plibersek said the expansion of the program, which began in 2011 and is funded until 2016, would result in 90 Headspace sites being established to help up to 72,000 young people each year. “Being young is complicated and your teenage years are not always the best years of your life,” Ms Plibersek said. The Launceston Headspace office has been open for five years and has already dealt with 15,000 cases. 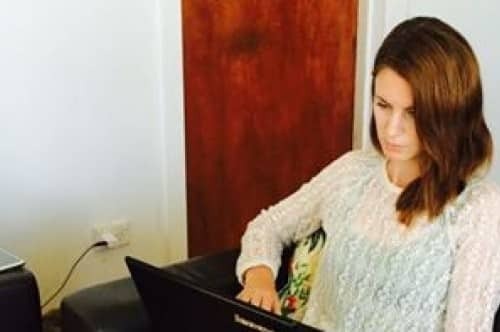 Gaming addiction was a troubling emerging trend in Tasmania and had been shown to lead to adult gambling addiction, a Headspace spokeswoman said. Mr Lewandowski said his slide began in high school and led to self-harm and drinking. “I became disengaged and moved into weed, acid and nitrous-oxide. To call me paranoid was an understatement,” he said. Mr Lewandowski started using meth amphetamine after moving to Perth. “I went into a lifestyle of a full-blown junkie,” he told those gathered in Devonport. “I then found Headspace. If it was not for them I would not be here today. No happy person takes drugs but that is not something society accepts. Young people from around Tasmania will meet in August to try to find solutions to the state’s long-running youth retention problems and pass them on to decision makers. Data from the Australian Bureau of Statistics shows young people represent a lower proportion of the total population in Tasmania than anywhere else in the nation. Those aged 20-40 years old make up only 30 per cent of the state’s population, compared with 36 per cent for Australia as a whole. “This in part reflects a net outflow of young adults from Tasmania to pursue education and employment opportunities interstate,” the ABS said in its population statistics report. The Youth Network of Tasmania’s consultative body, the Tasmanian Youth Forum, will conduct the forum on youth retention. A street survey of youth in Hobart conducted last week shows many young people still see leaving the state as their best employment option. Others see Tasmania as a good place to retire but a place to leave in their prime. YNOT chief executive Joanna Siejka says Tasmania’s young residents were a diverse bunch but it was important all had the same access to opportunity. Ms Siejka said programs such as UTURN — due to be cut by the State Government — had proved their worth. “The challenge is to ensure that all young people who need the support of these programs are able to access them now, and into the future, so that they have the best chance in life,” Ms Siejka said. Last week retiring judge Ewan Crawford said he had witnessed the growth of a new underclass of young people in Tasmania. “I see a growing underclass of young people who, from the day of their births, have never had a hope of turning into respectable citizens,” Justice Crawford said. In the lead-up to National Youth Week, Ms Siejka said that for the most part, young Tasmanians were a diverse but resourceful, innovative and passionate group. “Despite the economic challenges facing young people today, they have found new ways to be engaged with society and each other,” she said. National Youth Week is celebrated from Friday to April 14 and will feature many events. What do you think the future in Tasmania will be like and would you consider moving interstate to find a job? What could be improved? I think public transport in the state could be made better. After college I’d like to travel, but I haven’t made my mind up yet. I think the education system needs to be improved so it can help people early on if they are struggling. I’d like to stay in Tasmania because I’m doing a lot of science stuff and I’d like to work for the Antarctic Division. I think the education system could be improved. I’d like to see it become a bit more personalised. I think tourism in Tasmania will improve, though I don’t want to see it improve because I like the small community feeling. After college I want to study engineering. I’d like to stay and get a job in Tassie, but I would consider moving elsewhere if I couldn’t get one here. After college I want to go to university. Most of my friends are set on leaving Tasmania, which I see as not necessarily a good thing. I realise that I might have to move out of Tasmania if I can’t find a job here. I don’t really want to see any changes in Tasmania. I think we have a strong arts culture and a rich and diverse range of theatres and museums to attract people to the state. I’d like to move interstate to make a career working with children and move back to Tasmania when I’m older. I think we need to see our cultural background made more public on the mainland. It would help attract greater tourist numbers. I plan to take a gap year and travel after college, and hopefully some opportunities will open up for me at uni. I don’t agree with joining high schools and colleges together. I think tourism will go up, which we really pride ourselves in. I wanted to join the police force, but that can no longer happen because of budget cuts. Vintage posters will soon be seen in universities and pubs across Australia, in conjunction with a new campaign supporting LGBTI youth. 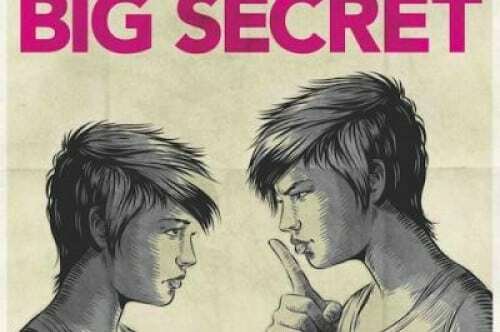 The posters which are part of a new headspace campaign, depict the story of ‘Charlie versus the big secret’, and aim to highlight the fear of social judgement and rejection many LGBTI people face. Chris Tanti, CEO of headspace, says the posters were designed in consultation with young LGBTI Australians in a series of surveys. “We want young people to feel comfortable to be who they are, but the sad reality is that discrimination and homophobia are a big problem in our society,” he said. “We want young people to know that if they’re having issues with friends, family, work or school because of homophobia or transphobia, they don’t have to go through it alone,” he said. The posters will also feature as postcards, and will be seen throughout headspace’s 40 centres, as well as print and online media. The initiative is the ninth instalment of a national awareness campaign by headspace and the National Youth Mental Health Foundation.